Argentina Discovery - El Palmar National Park. El Palmar National Park (in Spanish, Parque Nacional El Palmar) is one of Argentina's national parks, located on the center-west of the province of Entre Ríos, mid-way between the cities of Colón (54 km) and Concordia (60 km). It has an area of about 85 km² and was created in 1966 for the preservation of its characteristic Yatay palm trees (Syagrus yatay, formerly Butia yatay, Arecaceae family). Location: El Palmar National park is located in the Entre Ríos province, in the west of the Uruguay river, between Colón and Concordia Cities. Surface: It has a 8.500 hectares surface. Created: It was created in 1965 in order to protect a representative sample of the biggest “yatay” palm tree concentration of Argentina. The park’s famous historical ruins may be accessed from there. It is one kilometer away across the corridor rainforest, next to two bridges specially designed for this tour. When the bank of the Uruguay River is reached, the constructions may be spotted. These ruins, which belonged to an ancient lime facility, unveil the remains of limekilns, an old jetty and some old houses built by the river. But the real protagonists are the palm trees, known as the “Yatay” variety, which form colonies with specimens over 300 years old and over twenty meters high. Maybe due to all this, El Palmar is one of the sites on earth where seeking for explanations about its origin or formation is useless. And where nature, with its secret, will continue to be an enchanted place. It will still be God’s fault. yatay palm trees, petunias silvestres, chilcas, aromos, ñandubay. Pajaros carpinteros, ñandues, inambú or sudamerican, scrubland fox, cotorras, overos lizards, vizcachas. 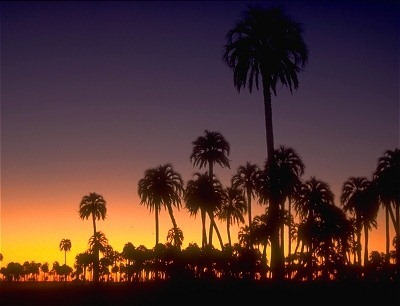 PN El Palmar (El Palmar National Park) protects the biggest “yatay” palm tree concentration of Argentine Republic. The protected area is characterized by a plain landscape which is conformed by different environments, such as “palmares”, pastures, “little forests”,“pajonales”, and “bank jungle”. The protected area belongs to the spinal eco-region. There are some typical communities of the “pastizal pampeano” ant the “paranaense” jungle. The spinal eco-region is characterized by a plain landscape, with variable lands, and has a changeable weather. The climate is warm and wet in the north, and mild and dry in the southwest. Originally, the “yatay” palm tree concentration had a big distribution: it was located in Santa Fe, Corrientes and Entre Ríos provinces. Due the farm installation and the excessive shepherding, the “yatay” palm tree concentration was declined. Today, there have been 23 visitors (147 hits) on this page!